This recipe tastes and looks great. Halve 4 of the peppers lengthways, deseed and place on a large baking tray. Cook the rice in boiling water according to pack instructions. Drain. Meanwhile, fry the onion in 1 tbsp oil for 5 minutes. Finely dice the remaining pepper and add to the onions with the courgette and cook for 2-3 minutes. Stir in the tomatoes and season well. Cook for a further 5 minutes. 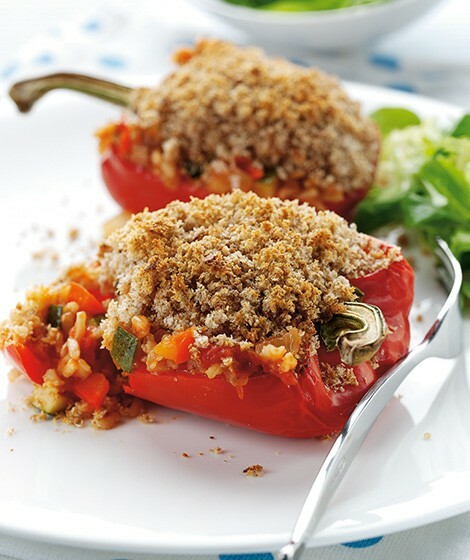 Stir the rice into the vegetable mixture and spoon into the halved peppers. Top with the breadcrumbs and bake for 15-20 minutes until browned.